Galito’s has launched an unusual dining restaurant at Al Wahda Mall. The South African franchise opened its second UAE location at Al Wahda. Its first location in UAE was in Yas Mall. The restaurant chain was found in year 1996 in a small South African town by Louis Germishuys. The restaurant specializes in flame-grilled peri peri chicken. Galito’s was discovered and brought to the UAE by Tablez Food Company, the food and beverage division of Lulu International Group. It will open two more locations in Abu Dhabi – at Marina Mall and Dalma Mall – and one in Ras Al Khaimah’s Naeem Mall by the end of the month. Chefs make the marinade from scratch, rub it on the chicken and let it marinate for at least 24 hours. It then gets thrown on an open flame grill. The fat from the skin melts away, which keeps the chicken low in fat and full of flavour. The menu includes Galito’s famous peri peri chicken, of course, as well as platters, chicken burgers and signature specials that include ­espetada, a Portuguese speciality of shrimp/chicken skewers, chicken livers and chicken satay with peri nut dip. The restaurant offers variety of soups, salads and ­notable side dishes that people loves relishing. The kids’ menu is a refreshing alternative to typical restaurants. Try the burger-izza – a pizza-style open burger with chunks of chicken covered in melted cheese – or the chicken and cheese pockets. 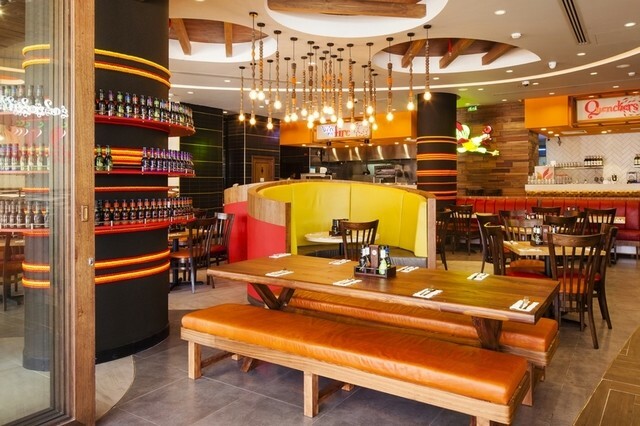 Galito’s is one of the least expensive restaurants in the city that offers delicious peri peri chicken at Dh100. The restaurant offers the customers an opportunity to watch the chef’s at work.